Enjoy a couple weeks exploring the very best the U.S West Coast has to offer. Your journey begins and ends in Los Angeles and takes in stunning national parks, such as Grand Canyon, Death Valley & Yosemite, as well as world class cities such as Las Vegas and San Francisco. 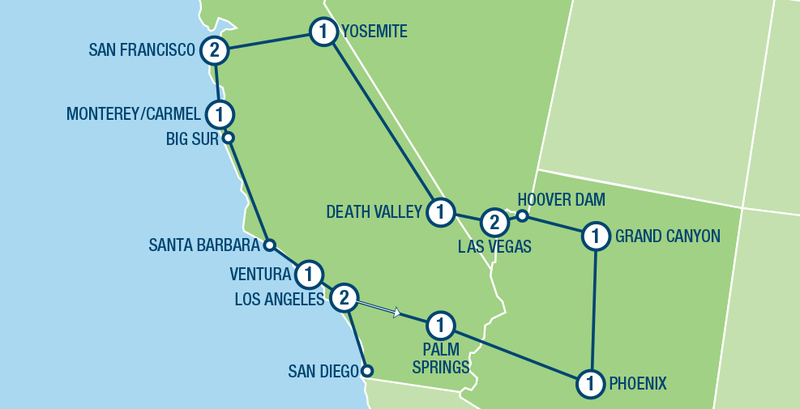 You’ll also enjoy time in Palm Springs, Napa Valley and more. Your itinerary includes 13 nights standard 3 star accommodation, welcome kit with maps, driving instructions and suggested stops and sights.